Murti can be reached by rail after reaching at the New Mal junction or the New Jalpaiguri junction from where you can hire cars. The nearest airport is Bagdogra and the National Highway 31 connects Murti to other cities and small towns. The distance of Murti from Siliguri is 73 kilometers while from New Mal it is 18 kilometers. From Chalsa it is a distance of only 8 kilometers which hardly takes a half an hour drive. 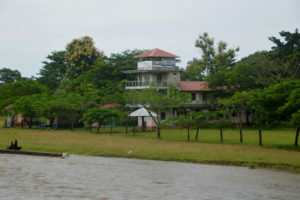 Banani or Prakriti O Poribesh Beekshan Kendra is the nature education and wilderness resort located next to Gorumara National Park on the Nahrakata-Lataguri road. The bungalow is amidst sal forest on the bank of River Murti and is the primary choice of any tourist. It offers 12 rooms including one suite providing the best view of the river and the forest. Another excellent accommodation facility known as the Murti Tourist Lodge run by West Bengal Tourism is located near Gorumara National Park on the river bank. The rooms are tent or cottage style with a view of the river bed and animals. Other facilities include the privately run Prime Murti, Riverwood Forest Retreat, The Ca-Cur-Badi Forest Resort, Dreamland Hotel, Resort Olive Village and Dooars Nest. Food is available at all these accommodation facilities. Murti can be visited anytime of the year because it has a pleasant climate. However, it is wise to avoid the monsoons because you will not be able to explore the forests on either side of the river. The Gorumara National Park and the Chapramari Forest are on opposite banks of Murti and are famous for the diverse flora and fauna. There is a small bridge through which you can cross the river and arrive at the jungles on either side. You can explore the jungles either on elephant back or through jeep safari depending on your choice. The beauty of nature in the region is quite a visual treat. However, roaming around the area at night is not advised because wild animals flock on the banks to quench their thirst. 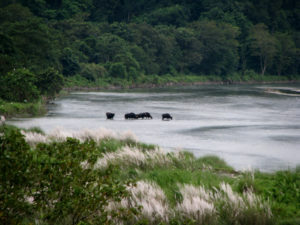 Wild Bisons crossing Murti river. Angling, camping and hiking through the trails are some of the commonest and most adventurous activities in and around Murti. If you are bird enthusiast then this is a paradise for you as you will see various local and migratory birds on the river bed. You can also spot alligators in the river. 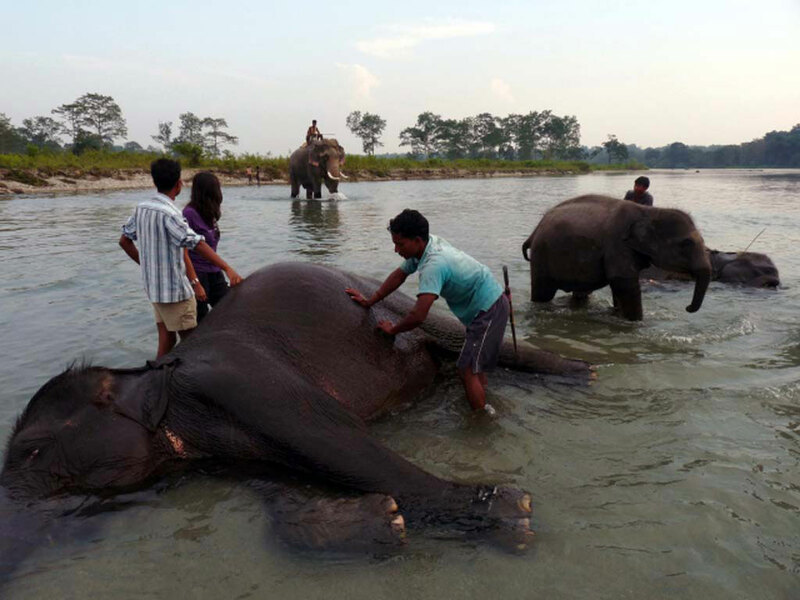 Other tourist attractions include the Panjhora River picnic spot, Chukchuki, Chalsa, Khunia, Jhalong, Bindu, Samsing and Suntalekhola. This entry was posted by indispottravel in Dooars in West Bengal, Forest Bungalow in West Bengal, Jungle Safari in West Bengal, Picnic Spots in West Bengal, Weekend Destination around Kolkata, West Bengal, Wildlife in West Bengal and tagged accommodation facilities in murti, adventurous sports in murti, Angling in murti, attractions in murti, best time to visit murti, Bindu, birds in murti, bungalow in murti, Ca-Cur-Badi Forest Resort, camping in murti, Chalsa, Chukchuki, cottage in murti, distance of Murti from alipurduar, distance of Murti from Chalsa, distance of Murti from New Mal junction rail station, distance of Murti from NJP, distance of Murti from Siliguri, Dooars attraction, dooars in west bengal, Dooars Nest, doors north bengal, dours tour, Dreamland Hotel, Forest, government Murti Tourist Lodge, hiking in murti, hotels in murti, how to go to Murti, how to reach Murti, Jhalong, jungle, Khunia, Murti, Murti location, Murti river, Murti river originates from the Neora Valley National Park, Murti Tourist Lodge, north Bengal, Panjhora River picnic spot, picnic spot in Dooars, picnic spot in jalpaiguri, picnic spot in west Bengal, picnic spot of north Bengal, Prakriti O Poribesh Beekshan Kendra, Prime Murti, private hotels in murti, reaching Murti, resort in murti, Resort Olive Village, Riverwood forest retreat, rooms in murti, Samsing, staying at Murti, staying options in murti, Suntalekhola, watchtowers in Murti, wildlife sanctuary.